I hope everyone had a happy Easter yesterday! Leah and I took an unexpected blogging break- in the past couple of weeks, we have taken two college visits to locations in the 6-hour range away, gone to prom, and worked a lot at the bakery we were hired at- about 18 hours between Thursday and Saturday alone. We were not in the kitchen much! However, we’re off from school this entire week and hopefully will be back to cooking and blogging. I missed it, even though being busy can be fun too. However, we did squeeze in a birthday party for our brother Henry’s eighth birthday. It was a casual affair, kind of a glorified playdate, with about 15 second graders running around our yard. Henry wanted a funfetti cake. We made a full-sized cake and then a bunch of cupcakes just in case. 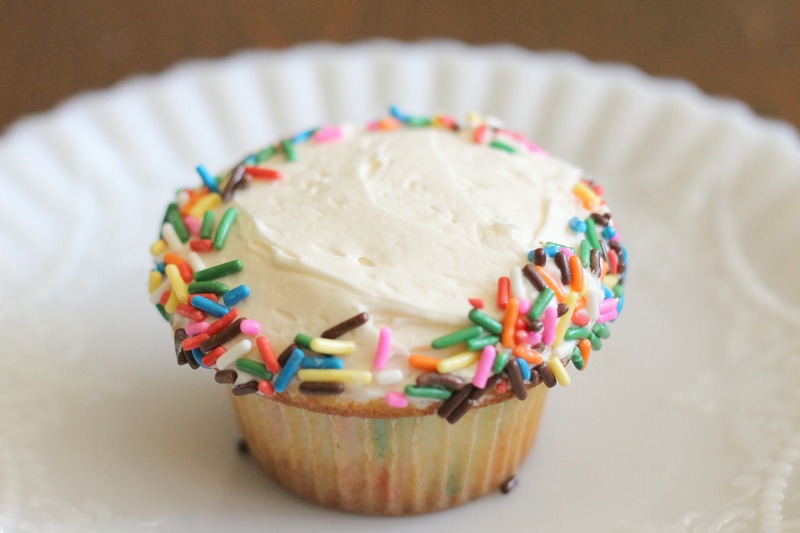 We’ve made this particular funfetti recipe before and loved it. It’s very simple to prepare and uses a reverse creaming method- if you can make boxed funfetti cake, with a little extra time and effort (but not too much more) you can make this batter. 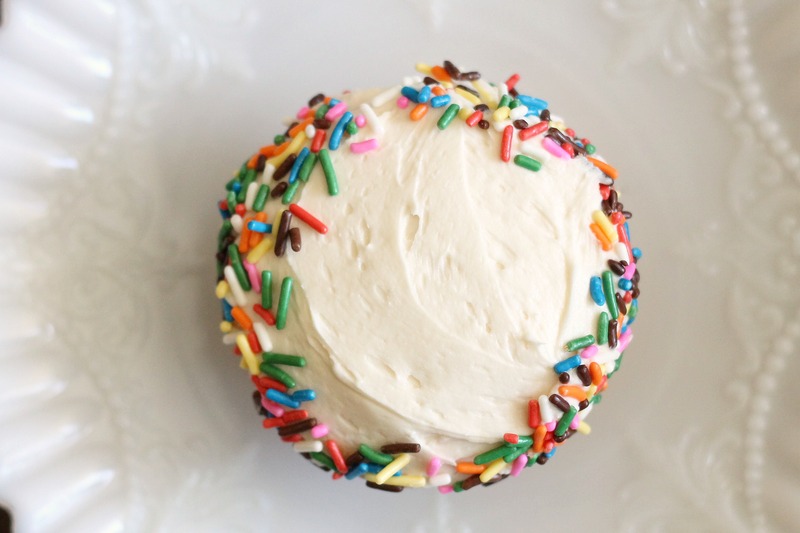 The frosting is fluffy and delicious with just the right level of sweetness, though we also frosted a couple cupcakes with chocolate frosting for kids who prefer it. These cupcakes were a big hit! Preheat oven to 350°F. Line two muffin pans with 24 liners and set aside.In a medium bowl or measuring cup, combine and stir the eggs, 1/4 cup of milk, vanilla and the almond extract. In the bowl of an electric mixer fitted with the paddle attachment, mix the dry ingredients, including the sugar, together on low speed for 30 seconds. Add the butter and mix on low speed for 30 seconds. Add remaining 3/4 cup of milk and combine on low speed until moistened. Increase to medium speed and mix for 1 1/2 minutes. Scrape the sides of the bowl and add the egg/milk mixture in 3 separate additions. Mix on medium for 20 seconds after each addition. Gently stir in the rainbow sprinkles with a spatula. Divide the batter between the muffin liners and bake for 20-25 minutes until lightly golden on top and a tester inserted in the center of a cupcake comes out clean (rotate cupcake pans halfway through). In the bowl of an electric mixer fitted with the paddle attachment, whip butter for 8 minutes on medium speed until pale and creamy. Add remaining ingredients and mix on low speed for 1 minute, then on medium for 6 minutes until fluffy. 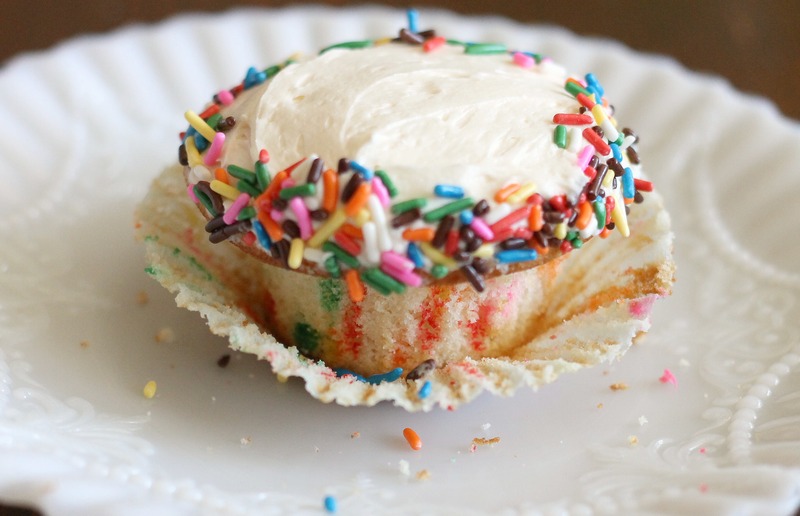 Spread over cupcakes and top with sprinkles. Enjoy!